In my previous analysis of the tablet market, I had estimated that Android tablets would overtake the iPad's market share by Q2/Q3 2013, if the iPad Mini was launched in Q4. Let's delve into an analysis of the prevailing tablet market share trends and take a look at how realistic that estimate is. IDC's latest report shows that the iPad's market share dropped to 50.4% in Q3. The long-term market share trend is very similar to the smartphone market, but remarkably cyclical. Every new product launch gives the iPad a boost, but Android tablets have continued gaining ground in the remaining quarters. 1) Rumors of the iPad Mini's launch surely assisted in the iPad's Q3 drop, but to what extent? 2) In the chart above, Quarter 7 (Q4 2011) looks like an aberration. If it is, are Android's current market share gains sustainable? In order to answer these two questions, we need to take a look at the shipment and QoQ growth data. 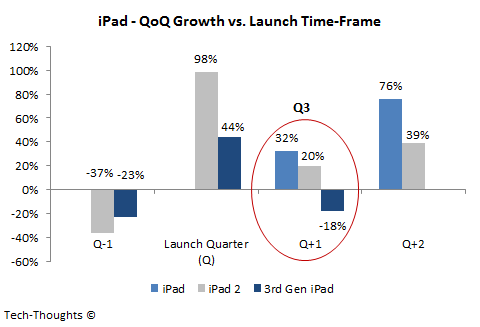 The QoQ growth chart above shows that Q3 has traditionally been a weak quarter for iPad shipment growth, with QoQ growth dropping in successive years. However, the drop in Q3 2012 was particularly severe thanks to iPad Mini rumors and a slowdown of channel shipments due to the product refresh. Given the data from the last two product cycles, iPad shipments should have grown by about 10-15% in Q3, instead of dropping by 18%. This would peg the iPad's adjusted market share in Q3 2012 at about 55-60%, which is still a considerable drop from the last quarter. 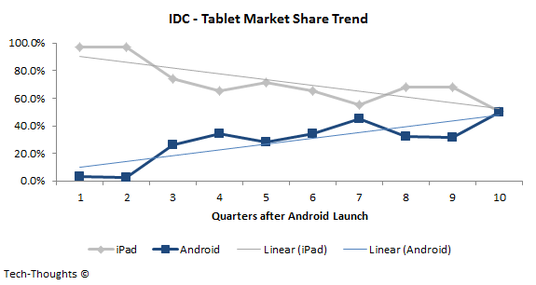 This shows that Android tablets' would have made strong market share gains even in the absence of iPad Mini rumors. The shipment chart above shows that Android tablet shipments soared in Q4 2011, but crashed in the following quarter before resuming growth. 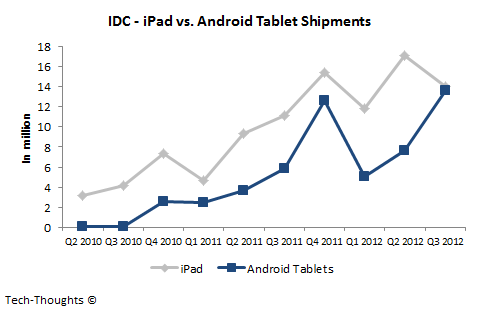 This suggests that Android tablets' market share gain in Q4 2011 was an aberration. However, Android tablet shipments have again accelerated from Q1 to Q3 2012, while iPad shipments saw a sharp drop in Q3. Is this growth sustainable? Let's take a look at OEM shipment data for some insight. As I had explained previously, we can see that Android's shipment spike in Q4 2011 was primarily caused by excess Kindle Fire inventory built up during the holiday season. 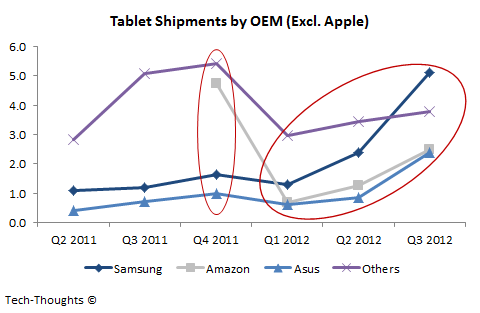 Also, in Q3 and Q4 2011, there is a temporary bump in the shipments of "Other" OEMs. This was caused by the initial sales and channel shipments of Barnes & Noble's low cost Nook tablet. However, since the Nook didn't have much of a content or application base, sales could not keep pace. These two factors contributed to the sharp drop in shipments in Q1 2012. Now, let's take a look at shipment growth from Q1 to Q3 2012. As compared to Q4 2011, shipments have been growing across OEMs. OEMs have learnt from Amazon's model that diversified price points would help expand the market and take share from the iPad. This has resulted in far more broad-based growth, which is not only sustainable, but should result in an accelerated ramp up of sales over the next 3-4 quarters. Q1 2013 is likely to see a cyclical dip in shipments, but we are unlikely to see a crash. The growth pattern across OEMs is very similar to the dynamics in the early stages of the smartphone market, which suggests that tablets are finally being adopted by mainstream users. Market share trends in Q4 should remain relatively consistent, with the iPad holding on to about 55% of the market, thanks to the iPad Mini launch. Android tablet shipments should see strong growth in the next quarter. As I said before, I don't expect the iPad Mini to take sales away from Android tablets. 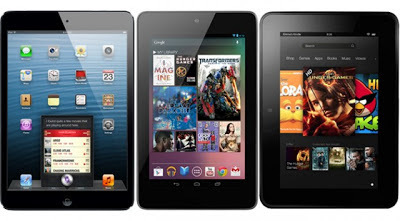 Early indications support my reasoning, as Kindle Fire HD sales spiked when the iPad Mini was launched, while Nexus 7 sales continue to remain strong. I will have more exact figures for Q4 after I complete my iPad & iPad Mini sales estimates for Q4. 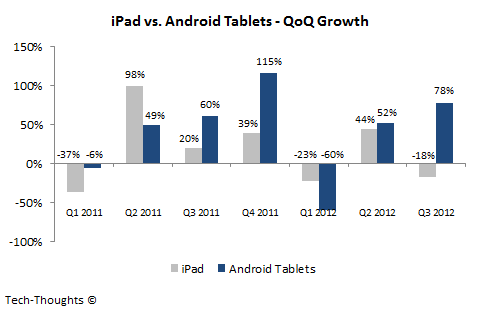 The QoQ growth chart above shows that Android tablet shipments have outpaced the iPad's sequential growth in six out of the last eight quarters (including the Q4 2011 to Q1 2012 drop). The iPad would have to consistently outpace the growth of Android tablets over the next year to hold on to its market leadership position, which is quite unlikely. Therefore, current tablet market share trends are consistent with my prediction of Android tablets overtaking the iPad by mid-2013. However, both platforms should see rapidly rising volumes, as market share gains will be growth driven. P.S. : I haven't included Windows tablets in my analysis as I expect them to have a negligible impact on the overall market. Surface RT sales are off to a slow start and OEMs have already lost interest in the Windows RT platform. This only leaves high priced x86 based Windows 8 tablets to compete with Apple & Android.